From first through seventh grade I attended New Braunfels public schools. Having nothing to compare with this experience, it was not until adulthood that I realized what is so special about a New Braunfels public school education. To this day, I can tell you that the Comal River is 72.6 degrees year round. 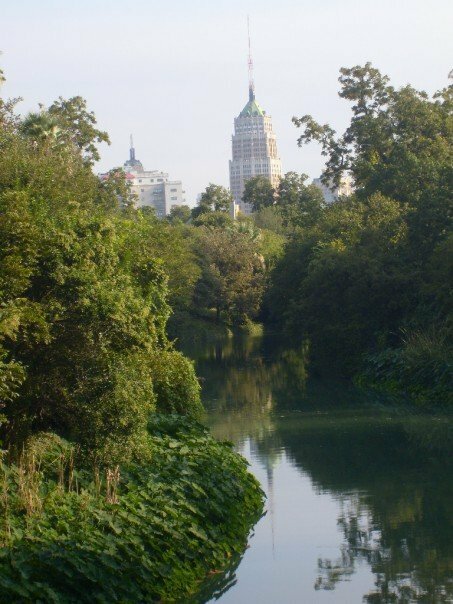 It is fed by a spring from the Edwards Aquifer and home to the blind salamander and fountain darter, both of which are endangered. New Braunfels was home to Ferdinand Lindheimer, the “Father of Texas Botany,” as well as a progressive German settlement that made a big impression on Frederick Law Olmsted as he journeyed across Texas. I don’t know if the testing regimen still allows for it, but the local history and ecology taught to New Braunfels ISD 3rd graders at Herman Seele Elementary in 1992-93 was the stuff of naturalist fantasies. I learned to see myself as a part of the unique civic and natural history of a spring fed town. Understanding where water comes from is essential for urban living. We run a high risk of seeing it as an inexhaustible resource, generated by nozzles, knobs, and hoses. In the area served by the Edwards Aquifer (and the Trinity Aquifer beneath it), the conversation is peppered with words like “recharge zone” and a random number somewhere in the 600’s that tells us when we can and cannot water our lawns. Local news and conversation is flooded with juicy information about latest water politics and crises, so the dynamic nature of water issues does not require specialized knowledge once you are able to interpret the language. A basic understanding of historic geopolitics is helpful as well. Sounds like a quest for the Curious Urbanite. “J-17”– Every night on the news, the weather man announces the aquifer level. The record high was in 1992 at 703 and the record low was 612 in 1956. This number is the primary determinate for water usage restrictions in the city of San Antonio. So how do they get that number? They get it from one artesian well near the cemetery at Fort Sam Houston, J-17. Like all artesian wells, the water in J-17 is being pushed up toward the surface by underground water flowing from higher altitudes is the north and west (the contributing and recharge zones..more on that later). However, unlike Comal Springs or San Marcos Springs, J-17 does not bubble up above the surface. The water simply rises and falls within the natural well, depending on how much water pressure is acting upon it from the aquifer. If the water in J-17 reaches 640 feet above sea level…the weatherman says that aquifer level is 640. Which, I believe, is Stage 4 water restriction and you can kiss your grass goodbye. If it reaches 680 we all run around naked in our sprinklers…which is stupid because if we conserved water at 680 the way we do at 640 then we would never see 640. Zones– Three zones comprise the Edwards Aquifer. Contributing zone, recharge zone, and artesian zone. The contributing zone is not as helpful as it sounds. It is the high, dense land where rainfall runs into streams and rivers which travel downhill. It’s where water collects, but it doesn’t enter the aquifer until it reaches the recharge zone. The recharge zone is area that is shaken and cracked so that water can fall down into the aquifer from the surface, and the abundant Trinity Aquifer can share water with the Edwards. The thing about the recharge zone is that it is small and delicate. And in high demand for development. But every piece of ground covered with a house or a shopping center is no longer cracked and porous. And every contaminate that runs off of a recharge zone parking lot into the cracks and pores around it goes straight into the same aquifer we drink out of. The third zone is the artesian zone. That’s us, the big city with our 100 gallons per person, per day. It’s also, though, the natural springs in New Braunfels and San Marcos. When I was a kid, we used to go to Comal Springs and drink from the ground, claiming that it was the purest water in the world because it was coming straight from the aquifer. Water Quality– right now, the Edwards Aquifer Authority (established in 1993 to keep the Federal Government from seizing control of the Aquifer under the Endangered Species Act) has the unenviable job of regulating how much water can be pumped from our limestone sponge. While this is a vast improvement over the wild west style “rule of capture” law, which basically said that ground water belonged to whomever could access it (as opposed to surface water, which was tightly regulated to keep people from using rivers as their personal water tanks), it does little to address the compromising elements to our water quality. EAA is take valiant stabs at water quality management, but they face geopolitical hurdles on both the quality and the quantity fronts.Because the aquifer works as a filtering agent, the quality issues are not quite as dire as the quantity issue, which seems to be in perpetual DEFCON 3. So until we start dying of cholera, we’re going to have to live with some asphalt sealant in the runoff. Agriculture in the west and development in the north are greatly inconvenienced by restrictions that will keep springs flowing and drinking water clean in San Antonio, New Braunfels, and San Marcos. More to the point: Texans have a hard time being told that what is on their land is not strictly their own. If the 3rd graders at Seele Elementary were told that their precious Comal Springs would soon be toxic because the recharge zone was all paved over, they would be so confused. They would wonder if the culprits had known what they were doing. Did they know that they were hurting people on the other end of the water table? They would wonder why no one stopped them. If the water bubbling out of Comal Springs belongs to all of us, how can it belong to one person when it’s under the ground in Bandera? For this Curious Urbanite, knowing how the aquifer works made the litigious grabbiness of many of my fellow Texans seem absurd and immoral. The more I learned about the resources we share, the more I stood in amazement at those who consider it their right to screw the rest of us. And, for one more moment on my little urban soap box, I say that it is ironic that we smile upon mission agencies trying to bring clean water to Sub Saharan Africa while we are so busy dying on the hill of “keeping the government out of my business” that we are compromising that very resource for our own neighbors.